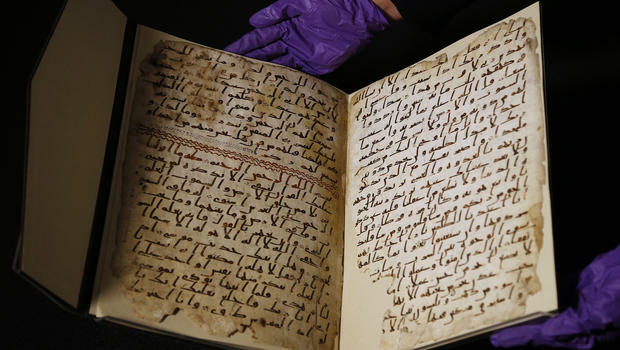 In 2015, it was breathlessly announced by the media that the oldest copy yet of the Qur’an had been discovered in Birmingham, England. Media reports assured readers that the text could have belonged to one of the companions of the prophet himself as initial Carbon 14 dating indicated that it dates from 650’s CE. If that is all you heard about the so-called ‘Birmingham Folios’ you would assume that they provide powerful confirmation of the traditional Islamic account of Qur’anic origins. Things are, however, not nearly as simple as this. Most readers will be familiar with the use of Carbon 14 dating (this is where the deterioration in a certain type of carbon molecule is measured in order ascertain the age of an object containing carbon). While this is sometimes used in textual dating, it can typically not be used to give a definitive reading on when a text was produced. The reason for this is certainly applicable to ancient Qur’anic manuscripts. Many of these manuscripts (and this includes the Birmingham Folios) were written on animal skins. This means that a manuscript may have been written on animal skin that belonged to an animal that was killed decades before ink was first applied to its leather. This was a widespread practice as skins were precious and often scraped and re-used multiple times. Unless a way can be found to reliably test the age of the ink (this is very hard to do as it has obviously seeped into the writing surface), there will always be questions about the Carbon 14 dates assigned to documents based on animal skin. To make matters even more complex, some laboratories which ran follow-up tests on the folios really threw the cat among the pigeons by claiming that the text predates the time of Muhammad. This could, of course, be due to the ‘dating ink vs. dating the writing surface’ problem described above, but it does show the problems associated with relying solely on Carbon 14 dating in the case of ancient documents. Be that as it may, an early date (i.e. pre-Muhammad) would be fatal to the entire Islamic theological edifice as it will point to parts of the Qur’an being around before supposedly being ‘revealed’ to Muhammad. As it turns out, this is exactly the area where the discovery of Birmingham Folios, received with such joy in the Muslim world, could be yet another nail in the coffin of the traditional Islamic understanding of how their holy book came into being. To see why this is the case, we must turn from the uncertain world of Carbon 14 dating to analyzing the text itself. As the name indicates the Birmingham Folios contain only a few pages (i.e. folios) from what is believed to be the Qur’an. They are, therefore, nowhere near to being a complete Qur’anic manuscript. The first thing to note is that the text on these pages do not align perfectly with the Qur’an currently in use by Muslims. It is orthographically different, especially in the fact that it leaves out the Arabic letter ‘alif’. Its verse divisions are also substantially different from the Cairo 1924 text in use today.